My family is hard to buy Christmas presents for. Oh, not my kids — they're comparatively easy. But my dad, my brother and sister-in-law, and my sister and brother-in-law — they're hard to buy for, because like me, they pretty much have everything they really need. But for me, and probably for most of you reading this blog, it's absolutely true that for the adult members of your close family, it really is the thought that counts. So I've decided that this Christmas — and probably for every Christmas to come — I won't buy any more junk for my adult family members. I can better show them that I love them, and that I'm thankful for them, by showing thanks and love on their behalf to others who really, really need it. This year, I've chosen to make donations on their behalf to the Intrepid Fallen Heroes Fund. constructing a world-class state-of-the-art advanced training skills facility at Brooke Army Medical Center in San Antonio, Texas. 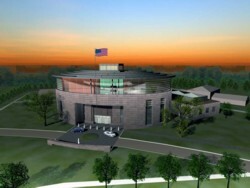 The center will serve military personnel who have been catastrophically disabled in operations in Iraq and Afghanistan. The center will also serve military personnel and veterans severely injured in other operations and in the normal performance of their duties, combat and non-combat related. accepting donations to provide additional services to the patients who will be treated in the Center and their families. These services may include facilities for patients' children, additional medical equipment and supplies, medical research to improve the care of patients, or other areas relating to the Center's activities including the patients and their families. One hundred percent of the contributions will continue to go to these services, with nothing taken out for the Fund's administrative costs. I like the fact that the Center for the Intrepid is in San Antonio, relatively close by, and in a local economy where a buck's investment goes a long way (and is likely to indirectly benefit other military families concentrated there). I like the fact that the Center will "be fully staffed and operated by [the] U.S. Army Medical Command with operational budget dollars." And I also like the fact that the new facility "will be built in conjunction with and attached directly to two 21-room Fisher Houses" — the work of another fabulous (and highly rated) charity "that enables family members to be close to a loved one at the most stressful time — during hospitalization for an illness, disease or injury." Best of all, I like the fact that the Fund is listed among the top-rated military charities by the American Institute of Philanthropy, with an "A+" rating based on the percentage of contributions that actually go toward the Fund's purposes as compared to administrative and fund-raising expenses. The Fund's Board of Trustees, comprising a bunch of folks who've been very financially successful, "underwrites all administrative costs," which means they're actually doing something besides showing up for fancy dinners and getting their pictures in the newspapers. A round of applause for these fat cats, please! There are, of course, many other worthy charities. The Intrepid Fallen Heroes Fund is just one of many military-related charities, and there are of course many other worthy special purpose-related charities (for example, still helping hurricane disaster victims) and general purpose charities. As fortunate as my family and I are, however, I just can't bring myself to spend money at Christmas-time on another necktie or battery-operated whatzit or coffee-table book or, worst of all, something destined to gather dust at the back of a closet. And hey — with online giving, you can click a link, maybe open a new browser window, and finish your hard-to-finish Christmas shopping in less than five minutes! Print out a page about the charity you've donated to, print out the email confirmation that will list in whose honor or memory your donation was made, and pop them in a Christmas card — and voilà, your gift-wrapping is also done! (Most charities, including the Intrepid Fallen Heroes Fund, will also send a confirmation card by regular mail ot your honoree, per your specifications.) Then sit back, give a hearty Ho-Ho-Ho! — and join me in counting our blessings.